It’s an every day occurrence for some of us lucky ones, but a pipe dream for others – gaming with our better halves, that is. “Quality Time” with my wife is often spent rolling dice or shuffling cards at the kitchen table, cloistered up in our bedroom in front of our PC’s playing a game or vegging out in the living room around the xbox with the kids. Speaking of kids, mine are much the same (though in moderated and monitored amounts). We are a family of gamers, and I couldn’t be happier about it but for others even so much as convincing their loved one(s) to sit down and game with can be like pulling teeth. Mind you, getting my wife into gaming may have been a bit easier for me than others, but it was no cakewalk by any means. She grew up playing Sega and Playstation games, board games and the like but always had reservations about the “D&D Nerds” her older sister hung out with in high school. Computer games were not really a thing in her household either, aside from maybe The Sims or flash games online, so when I met her and told her I was a ‘gamer’ she vastly underestimated what I meant by that. A few years ago, during the first few months of our relationship and several days into the first of many reactivation/cancellation cycles of my World of Warcraft account, she got her first glimpse into what true ‘gamerdom’ could be. At first WoW wasn’t even something that really appealed to her, and I was definitely going about it all wrong in attempting to show her what the game was all about. At one point she was finally about fed up with me playing the game, so I decided it was time to re strategize my approach and explained the elements of the game that I thought she would enjoy most, as opposed to my own gaming-malformed brain. So I marketed it as a game where you get to create a little person, buy her fancy clothes, blow things up with fireballs, go shopping and ride pretty animals – and somehow it worked. She had said [paraphrased] “Okay, show me how to play this game if you’re going to be spending so much on it” and then, not before long – Dibbles the gnome mage was born. 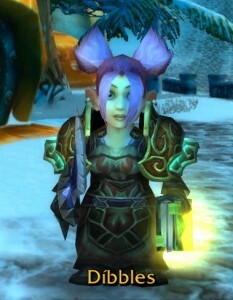 At first I critiqued her every move as if she’d been playing games her entire life like I had, and told her things to look forward to were huge group battles where you get to fight for an item you want with 20+ other folks or getting repeatedly killed by other players while trying to earn gear or complete a quest. Funny, that doesn’t sound like fun at all, but it did to me. Needless to say I caught on somewhere along the line and made the experience more personal for her, joined her on a low level character and quested with her as opposed to running around separately doing my own thing or powering her character through dungeons, thus granting her no real play experience or knowledge of how to play her character in a group situation. She enjoyed throwing fireballs at people and having cute pink pigtails but after a while the very grindy nature of what makes an MMO began to grate on her. We quit a few months after we started, and revisited occasionally but never for long. Though through all of this, I’d managed to get someone who’d be otherwise put off by a ‘deeper’ gaming experience to fall in love with it. All those game elements she learned in WoW became my building blocks for getting her to play D&D, Warhammer 40k, Magic and a ton of other games since then. The point of all this is, is that I believe most people only need one certain ‘gateway’ game to precisely strike something inside them that piques their interest, once you find that you embrace it, and build outward. Everyone is different though, and I realize this. For example, my boss’ girlfriend has quite a grudge against games like WoW but has taken quite a liking to playing Dungeons and Dragons with us all. She’s no min/maxer or role playing aficionado by any means but that’s not what’s important, finding a gaming niche she enjoyed was the tricky part. Of course I shouldn’t go without using the trite statement of ‘everyone is different‘ but it is entirely true, but I won’t delve into those details here because I’ve already written a comprehensive guide on getting non-gamers to game recently. I’m aware the overall purpose of this article may be diluted but I’ve always kinda wanted to tell this story, and my wife has really been the backbone of my driving gaming force lately. She always supports and urges me to press forward on new projects and endeavors, both in the gaming realm and out. She’s always willing to try new things and serve as my experimental gaming guinea pig whenever needed. She has wholly accepted me as a gamer, and acknowledges me for simultaneously trying my hardest to be a good father and husband, it’s quite a juggling act sometimes – but a fun one, and I wouldn’t have it any other way. I guess the holidays always hit my soft spot, so consider this my ubiquitous giving thanks post for 2010. I’ts been a fun year for me, I got this blog off the ground, gotten back into gaming, went to my first convention and even convinced myself to start the path towards returning to college to pursue a new degree. I’m absolutely estatic with the people I’ve surround myself with, family and close friends – it seems the older I get the better company I acquire. Further proving this point I’ve met a lot of awesome people this year too, both online and off – especially my readers and twitter friends. I know it sounds lame but you digital folk add another layer of companionship and cheer to my and I thank you for that. Keep on keeping on, and keep on gaming! I’m glad you liked it, I’m also really happy to hear that I may be giving some positive insight to others who are thinking of creating a mini-gamer army of their own! Cheers man! Good article, man. I am one of the lucky few whose significant other came into the relationship having played board games, D&D, and some others, and she got into WoW before I did. She’s not as much of a nerd about them as me, in that she doesn’t always know about all the sourcebooks and new expansions coming out, how gear works together, and that sort of thing, but she does enjoy the games, picks them up quickly, and often figures out strategy better and more quickly than I do. Nonetheless, I have played with a lot of gaming newbs as well (both to board games and RPGs), and I too find that the best way to get them interested is to give them something they can easily relate to and understand. For example, I usually start with Carcassonne for board games, because anyone can understand making the pieces fit together like a puzzle to build cities and roads, then pick up on the scoring and strategy as they go. On the other hand, if I were to try playing War of the Ring with a non-gamer, they would get frustrated almost immediately and never play a game again. Hell, it took *us* at least two dozen plays to get 90% of the rules down on that monstrosity, and we’re experienced gamers! The real eye opener for me was trying to play Super Munchkin with some non-gamers. To me, Munchkin is a very simple, easy to understand game that we occasionally use to kill time before a D&D session or when we’re bored. However, it turns out that it can be *incredibly* hard to follow for folks that do not intrinsically “get” magic items, levels, and monsters. It was truly painful to watch, and I really regret that choice of game. If I had it to do over, I would use Carcassonne, Pandemic, or Forbidden Island instead and we would have all had a much better experience. Mmm…guess I should have just written my own post, eh? To sum up, though, nicely said, and very true! My wife and I actually met through a LARP organization so I got lucky. We used WOW as a bonding experience during a long distance period and continue to play games and RP together. After years of dating I can’t imagine ever again being with someone who didn’t share my hobbies. It so fulfilling to have gaming time that is also wife time. I couldn’t agree with you 100% more, the double whammy effect is overwhelmingly awesome. It almost feels like I’m getting away with something so awesome it should be illegal! My wife played a lot of console games growing up, especially the Final Fantasy series, and was into Starcraft a little bit. There was one distinct day where I’d joined the Closed Beta for WoW and had been playing for an hour or so and was about to go hang out with a friend when I suggested she try playing WoW while I was gone. She asked, “Can you be a Paladin in it?” Let’s just say once I got home a few hours later we began a torrid affair for a year or two of fighting over a single WoW account, eventually got one account for each of us (transferred my level 60 character over to my own account), but we’ve long since lapsed out of the grind of WoW. She is a staple player in my 2 year old 4E D&D campaign at the moment, and we’ve had a lot of good times playing games like Starcraft 2 and Halo: Reach together. She hasn’t gotten into Warhammer though, probably due to the fact that I’m not a huge fan of the clunky and unbalanced rules, but most games she’ll at least give them a decent chance and try them out. Ya’ll are very lucky. I married a Japanese woman when I was living here a couple years ago. She is the perfect lack of nerdy in virtually every way. If I give her a Super Mario game, or a Donkey Kong, or even sometimes a Ratchet & Clank, she is fine, but the second I try to get her to play something that uses a keyboard or buttons that number more than jump/shoot/punch, she has totally lost interest. Very hard also to get her into roleplaying with the language barrier and cost of Japanese language material for games such as D&D. I’ll just say lucky!! and be on my way.